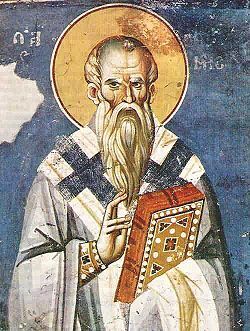 Our father among the saints Clement of Rome (also called Clemens Romanus to distinguish him from Clement of Alexandria) was the third in succession after the Apostle Peter as bishop of Rome. Clement is known mainly for the letter he wrote to the Corinthians in about AD 96. He is counted among the apostolic fathers. His feast day is November 23 in the west, but in the east he is remembered on November 25). Little is known of Clement’s life. What is known is from writers who wrote over a hundred years after his death, often inconsistently, and with great variety. These writers include Tertullian, Jerome, Irenaeus, Epiphanius, and Eusebius. His birth date is not known. He may have met Ss Peter and Paul and may have been ordained by St Peter. There are confusing propositions that associate him with the Clement in Paul’s letters (Phil. 4:3 (KJV)) and to a consul T. Flavius Clemens associations that now are considered not probable. The letter sent in about the year 96 to the Church of Corinth in the name of the Church of Rome has been attributed to Clement. The letter was sent in an attempt to restore peace and unity in the Corinthian church, where apparently a few violent people had revolted against the leadership of the church community. A second letter to the Corinthians had also been attributed to Clement based upon its inclusion in a Greek manuscript that included Clement’s first letter, with the title of “Second Epistle of Clement to the Corinthians.” But, when a missing ending to the “letter” was found, it proved to be a homily of unknown authorship. Guide our lives in peace! You are worthy of all praise! Guard us all through your intercessions! Hieromartyr Clement the Pope of Rome from OCA Web site. This page was last edited on January 4, 2015, at 08:30. This page has been accessed 37,017 times.